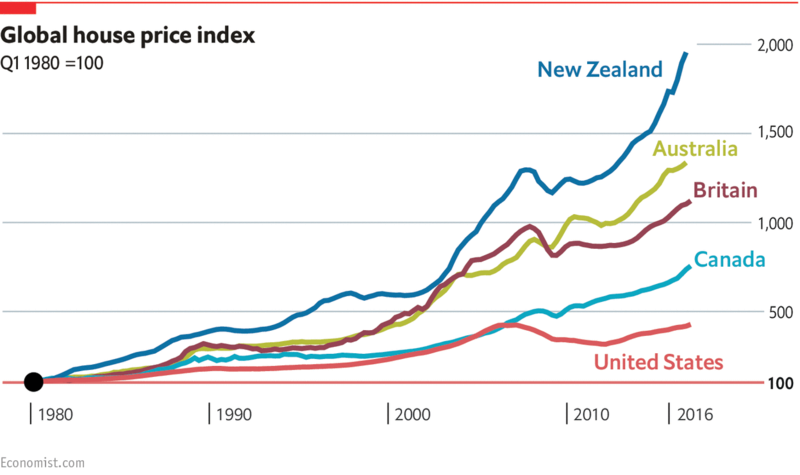 To gauge whether prices are fairly valued The Economist measures house prices against two metrics: rents and income. If, over the long run, prices rise faster than the revenue a property might generate or the household earnings that service a mortgage, they may be unsustainable. On this basis homes are fairly valued in America by an average of our two measures. But across Australia, Canada, New Zealand, and to a lesser extent, Britain, they look severely overpriced. Policymakers may well be left scratching their heads, however: increasing housing affordability for citizens and encouraging investment from foreigners are likely to be irreconcilable goals”. Disclosure: This website consists of the public articles, and this communication is for informational purposes only. Nothing herein should be construed as my opinion, solicitation, recommendation or an offer to buy or sell any securities or product, and does not constitute legal or tax advice. The information contained herein has been obtained from publicly available sources believed to be reliable but we do not guarantee accuracy or completeness. Do not act or rely upon the information and advice given in this publication without seeking the services of competent and professional investment, legal, tax, or accounting counsel.